I’m really excited about the battles today! Why? 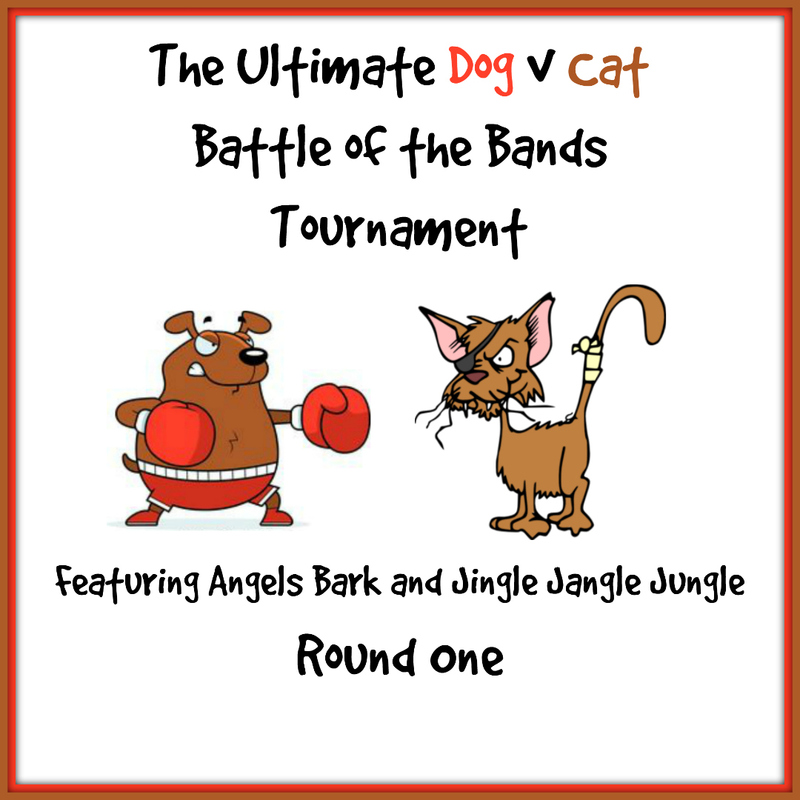 Because my good friend Michele from Angels Bark and I are collaborating on a small battle tournament. Recently, I had a ‘Feral Cat’ Battle followed by a ‘Dog Fight’ Battle. We’ve decided to expand on this idea. In 1977, rocker Ted Nugent released the song Cat Scratch Fever. It was the title song for his album of the same name. In 2009, it was named the 32nd best hard rock song of all time by VH1 This song has been covered by quite a few bands, but I’ve narrowed it down to 2 for you to choose from. The group broke up in 1993, with a number of previously unreleased demo recordings issued in 1999 on the M.A.C.E. Music compilation Gunnin' for Glory. In late 2016, it was announced that Gillette and Batio were set to reform the band, with Lamb of God drummer Chris Adler added to the group's lineup. Alongside bassist Victor Wooten and producer Kane Churko, Nitro is currently recording material for its upcoming third studio album, and has toured with Matt DeVries on bass. Pantera was an American heavy metal band from Arlington, Texas. The group was formed in 1981 by the Abbott brothers – drummer Vinnie Paul and guitarist Dimebag Darrell – along with lead vocalist Terry Glaze. Bassist Rex Brown joined the band the following year, replacing Tommy D. Bradford, who was the unofficial original. Having started as a glam metal band, Pantera released four albums during the 1980s. Looking for a new and heavier sound, Pantera replaced Glaze with Phil Anselmo in late 1986 and released Power Metal in 1988. With its fifth album, 1990's Cowboys from Hell, Pantera introduced a groove metal sound. Pantera's sixth album, 1992's Vulgar Display of Power, exhibited an even heavier sound. Far Beyond Driven (1994) debuted at number one on the Billboard 200. Tensions began to surface among the band members when Anselmo became addicted to heroin in 1995; he almost died from an overdose in 1996. These tensions resulted in the recording sessions for The Great Southern Trendkill (1996) being held separately. The ongoing tension lasted for another seven years, during which only one studio album, Reinventing the Steel (2000), was recorded. Pantera went on hiatus in 2001 but was disbanded by the Abbott brothers in 2003 amid communication problems and their conclusion that Anselmo would not return to the band. The Abbott brothers went on to form Damageplan, while Anselmo continued work on several side projects, including Down, which Rex Brown joined as well. On December 8, 2004, Dimebag Darrell was shot and killed on stage by a mentally unstable fan during a Damageplan concert in Columbus, Ohio. Vinnie Paul died in 2018, permanently ending hopes for a reunion, and leaving Glaze as the only surviving member of the band's first line-up. I’ll keep the voting open until Sunday, July 22 @ 3pm EST with results posted on Monday, July 23. I’d like to encourage you to visit the other bloggers participating in the battle of the bands as well, but especially would like to encourage you to visit Michele’s battle in this tournament. . We’ve put a lot of time and effort into putting together these battles and they are a lot of fun. Each blogger has a different battle taking place. You can find a current list on Stephen’s blog (don't forget you can also request to join the battle of the bands blog hop by simply commenting on his blog that you'd like to join us). For those of you who may be interested - The battles take place twice a month. Once on the 1st, and again on the 15th. Some participants have chosen to participate only once a month - and that’s okay - we’re just happy to have you join us! Your battle can consist of covers of the same song, different songs with the same title, or even a themed type battle. We just want you to join in the fun! All you need to do is drop Stephen a comment on his blog and he’ll add you to the roster of participants. This is a very cool idea you and Michele have put together. It's like an expanded and upgraded concept that FAE (the other founder of BOTB) and I did way back in "the day", using the song 'The Look Of Love'. Hmmm.... Well, I must say that I like Ted Nugent a little more politically than I do musically. I honestly can't think of a single Nugent song I can truthfully say I like. Instrumentally speaking, both of these recordings sound almost identical to me. Not surprising, because there's probably not a whole lot one can do with a Ted Nugent song. They are what they are. However, I'll cast my vote for NITRO based on the sound of the vocalists. That second guy... I dunno, he just sounded like he was shouting in an alley, spoiling for a fight. His girlfriend (if he has one -- which I doubt) needs to try to calm him down and drive him home -- he's had too many Boilermakers. It's going to be fun watching this tournament play out! POSTSCRIPT: Is there a trick I'm not familiar with to make that column of "share links" on the left side of the blog disappear? I can't find an "X" to click to make them retract, and they are blocking out the first word or two on the left edge of every one of your sentences. Is there a way for me click something to make that collection of "share links" sleep with the fishes? I played with the settings a little bit for you. Hopefully you can see everything now. Was it just this post you've had issues with, or has it been all of them? On my side, I see two distinct columns with nothing cut off. 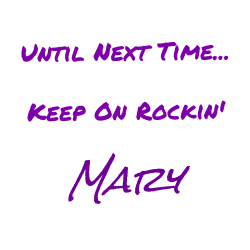 You won't have to worry about hearing anything new from the lead singer of Pantera as he died this past week. His brother, Dimebag Darrell, was killed onstage by a crazy fan back in 2004. I'm super excited about this Tournament. Really glad that Michele suggested the idea to me. 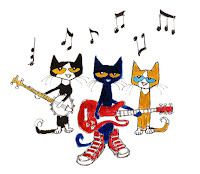 I went with cats because well, Michele is a dog person, and back in the day (a little over 20 years ago) I had a cat themed website/humor mailing list MsKitty's Daily Mews (Clean Humor) and Litter Box Mews (Not so clean humor) Perhaps one day I will bring those back to life. No, those sharing avatars are still obstructing my view of the left edge of the blog, but don't worry about it. It's like having a speck of something in my eye, but I can still figure out what the first word or two is simply by context. Maybe it's just me, so don't fiddle with the settings on my account. That's wildly insane -- the guy getting killed onstage. I never heard about that but will have to look into it. Your cat-themed mailing lists sound like fun. I can always use another good joke to help me make it through another day. Ah... The floating share buttons. Yes, I did make a change to those recently. I've made them smaller now, so hopefully you'll be able to see the posts better. Off to make my rounds to the other participants before I get distracted and sidetracked. They are actually still obstructing my view of the left edge, BUT(!)... now they're small enough that I'm able to see and click the "Retract Arrow" which removes them from view. Mary, this is actually the second time this has occurred. Some time back -- a year, maybe? -- this same problem arose. I made mention of it, and you were able to "fix it back" again. Unfortunately, I couldn't recall what you had done then to remedy the problem, so I was unable to tell you what the root of the trouble was now. This is now perfect (again). 1) Change is BAD (at least 95% of the time). 2) If it ain't broke, don't fix it. 3) If it still ain't broke, still don't fix it. 4) Less may not be more, but most of the time it is BEST. My feminine tendencies wile me into making changes every once in a while. >>... My feminine tendencies wile me into making changes every once in a while. Yes, I know. Believe me, every man... knows. >>... And change CAN be good sometimes, especially if it means progress. Yes. And you might win the lottery, too! Hi Mary; This is a fabulous idea you and Michele cooked up! Great way to have people coming back, as well. 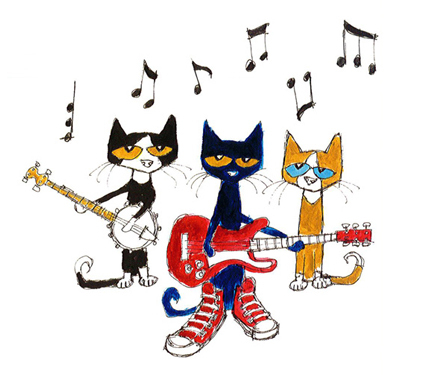 ☺ I've always liked "Cat Scratch Fever" and both of these covers were pretty good. Pantera has such a tragic history; I saw that news item about Vinnie Paul. May he R.I.P. My vote is going that way, since I preferred their heavier, more dramatic sound. Nitro didn't give it enough "oomph" in my opinion. First two votes in and we already have a tie! I'm curious as a cat to see how this one turns out. My compliments on the blogging idea! This should be fun. Way back in the mid-'90's, I attended the National Guitar Summer Workshop in Claremont, CA and had a chance to witness Victor Wooten working with young bass players. He was like R. Lee Ermey handling them, but damn, could those guys play bass when he was through with them. I'd vote for Nitro just on the basis of that, but there's more to it: I liked their sound better than Pantera's, parrticularly that of the vocalist. So, Nitro gets my vote. No Pantera for you :) It's Nitro all the way! Thanks for stopping in with your vote. That workshop sounds like it would have been a good one to attend. Not one of my favorite songs, but both of these renditions seem pretty credible to me. I'll give my vote to Pantera for their fuller deeper sound. I give my vote to Pantera. I really don't know why but I guess it is because they had a richer, deeper sound? The sound of the instruments were pretty distinct too, I love it when music has a rich bass sound. Groovy idea you and Michele have going with your upcoming battles! I enjoyed listening to both covers. I'll have to say you probably won't find me buying either bands' mewsic but I always like the induction of stuff I normally do not gravitate to. I'm giving my vote to NITRO because they sounded less heavy to me and the vocals were overall more pleasing to my ears. That was crazy to read the lead singer from Pantera was killed recently. WOW! I'll see you on the dance floor shortly. Have a bantastic day, dearie! Nitro definitely has that 80's hairband sound going for them. The lead singer of Pantera, Vinnie Paul, had a heart attack and died on June 22 of this year. His brother, Dimebag Darrell, died in 2004 when a crazed fan rushed the stage and shot him during their concert. I hope to out and about soon. Mondays are always crazy time for me, plus I'm waiting on the landlord to show up sometime between now and Wednesday. Something about upgrading my lights to LED. Well, you have come upon a nerd. I am not a fan of any of these. Buy i love the idea. Sounds like a fun thing to do. Whomp Whomp! You must have missed the part about the only wrong answer is a non-answer. Even though you don't care for either of them, surely you are able to decipher which of the two you like better. Hi there, a great way to get your readers and listeners engaged more. 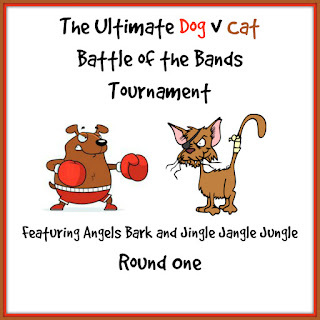 This is a great idea battle of the bands. I definitely prefer band number two. Pantera's version of Cat Scratch Fever is more melodic and less dramatic for my tastes. Both were cool, but I'd have to give my vote to Pantera. This is a really cool, fun blog concept. I enjoyed reading/watching. Thanks for sharing! Thanks for stopping in with your vote. I've got you down for Pantera. I love the sound of these battles. Sounds like great fun. Good you explained it all with the steps. It's truly disappointing that you point out that you read the steps, but you did not follow them. Is it really that difficult to state which contender you prefer? A blogger with no opinion? I'm seriously stumped here. What a great idea for a battle! I would have to opt for Pantera on this occassion. Sure do appreciate you stopping in with your vote :) Be sure to check back on Monday for the results. You have swooped in to save the day by narrowing the gap between Nitro and Pantera. It's not a huge gap, and the battle is too soon to call. How goes it? 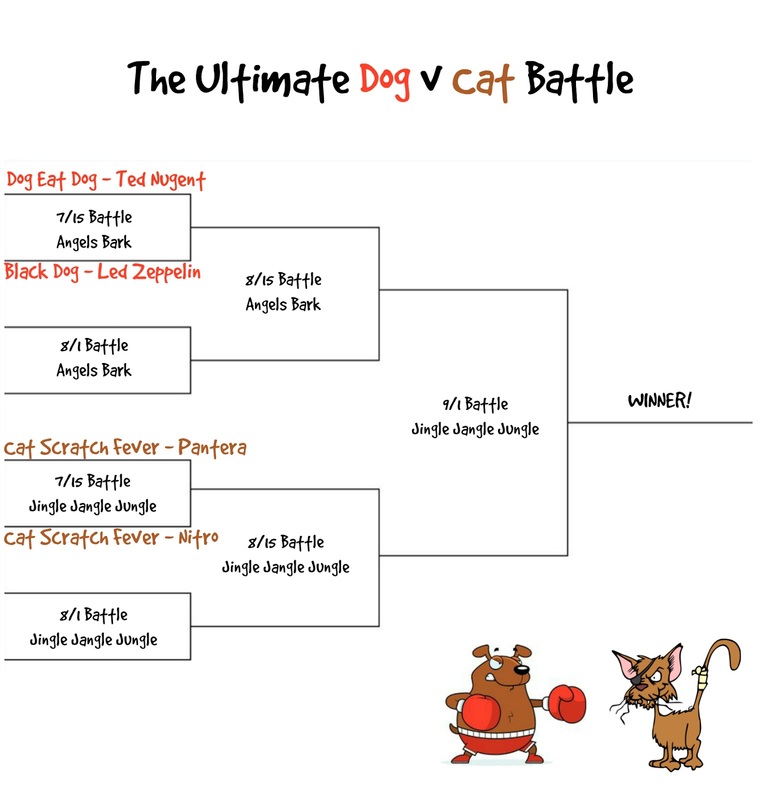 I'm so excited about our Cat v Dog Tournament! 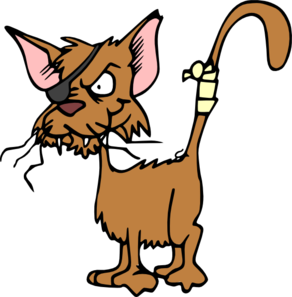 And weirdly, Cat Scratch Fever has personal meaning for me too. I contracted Cat Scratch Fever when I was a young child. A cat scratched the inside of my arm, between my wrist and elbow, and after a few days the scratch became super inflammed and there was a red streak running down my arm. So my mom took me to the Dr or to the hospital (I can't remember which now) and the doctor said I had cat scratch fever. And then his brother dies of a heart attack. That poor family! If their parents were still alive how horrible to have to bury two sons. I read through the comments and can't believe the people that take the time to leave a comment but not place a vote. Good grief! The one that really got me was the one that praised how well you explained the directions. REALLY??? Did that person skip the part about leaving a vote in the comment section?? OMG! That's highly irritating. I just rambled on in my last comment to you on the other post. LOL I must be tired or something! Yeah, the non-voters really grind my gears as well. And I *TRY* to be nice, but sometimes it just doesn't happen that way. Thankfully, there have only been 2 non-votes so far. Got ya down for Nitro. Message me your contenders for Round Two when you have a moment - so I can do the image. Not necessary my jams, and this is the first time I've heard of them, but I will cast a vote. My vote goes with Nitro. Thanks for stopping in with your vote. I know that not everyone likes the same type of music. Thank you for being open enough to listen and cast a vote. Much appreciated!